WE WANT YOUR CARDS AND VIDEO GAMES - From Any Game or System! If we don't have it on our buylist, we are still interested! Click on the Set Links on the Left Sidebar or Click for the Advanced Search. You will receive 50% more in store credit than you will in cash for the items sent to us. 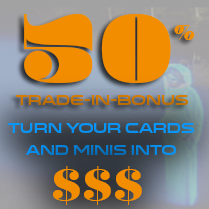 For Mint/Near Ming Condition Cards you will receive 100% of the buyback price. If we already have an adequate supply of cards in Slightly Played or Played condition and the cards that are sent in are in a lower condition than expected, the price can drop according to our inventory level and need. We grade each card under a natural light to be able to accurately grade the card. You can view how we seperate our grading categories. All orders must arrive within 7 days of the sell to us order being completed, we expect international orders to take longer and understand the delay. All Payments are made through Paypal or Check. For Check Payments $3 will be reduced from the total. Payment for shipping cards to us is handled by the seller. If the seller decides they would like a card/s back from their list, cards can be mailed back minus a reduction for sending the cards. If the full list of cards is returned, a paypal payment for shipping or a removal of cards can cover the shipping cost. Pack all items according to the list that is emailed to you. Orders not packed according to the order list shown can be charged a sorting fees as we will have to resort it to that order. All items must come from non smoking environments. Smoky smelling items may be returned at our discretion. Any returned items will be returned at seller's expense when they are not mint, the order is incomplete, and they are the wrong edition or type, or smoky smelling. Make sure you check versions and sets. It must be the card on the invoice so look at set, version(foil, not foil, alt foil,etc). Returned cards start at $3.00 for the first card and are $.05 each additional card. This covers the time we spent grading and the shipment of the cards back to you. If you are buying cards with store credit or placing a regular order, we can ship the cards you want returned without the $3.00 base and just charge $.05 for each card shipped with a placed order. All Figures should be boxed or bagged by set. We know they can't stay in exact order like cards, but at least they must be separated by set in baggies or boxes. Make sure all figures have boxes, cards pogs and or dossiers where applicable. Go to the online buy list. Click on the sell to us tab for each card you want to sell to us. Enter the qty of each item you want to sell to us up to the posted qty we are seeking on the buy list. The system will keep a cart of items you want to sell to us and a running total for you. When done adding all the items you want to sell to us, then hit checkout and fill in the requested data. On the last page of the checkout, you will come to a confirmation page that instructs you to print out your invoice. Print that page and write in either your paypal acct or your physical address to send cards to. Write your full name on the order so we can find your invoice when it comes in. THIS IS NOT TO BE CONSIDERED AN OFFER TO BUY, AND WE MAY RAISE OR LOWER BUY PRICES AT OUR DISCRETION. We reserve the right to return any cards for any reason at sellers expense. This will be rare and usually only in the case of database or typographical errors in pricing or quantity that may occasionally happen. It may also be that many people flood a few cards at the same time and we may return the excess quantity for the excess orders. THIS IS VERY VERY RARE, AND 99.999% OF THE TIME IF AN INVOICE IS MADE AND ARRIVES WITHIN 7 DAYS OF THE INVOICE, IT WILL BE PAID IN FULL. THIS LANGUAGE IS JUST TO NOTIFY YOU OF VERY VERY RARE CIRCUMSTANCES THAT MAY CAUSE US TO RETURN CARDS.OUR NEEDS CHANGE OFTEN AND CARD PRICES WILL EITHER BE LOWERED OR REMOVED AS OUR INVENTORY NEEDS ARE MET.